Bug bites and stings are one of the biggest nuisances of summertime. Follow these bug safety tips to prevent mosquitoes, ticks, bees, and wasps from imposing on your outdoor fun. Fragrance can attract insects like mosquitos and bees and increase your chances of getting bitten or stung. Insect repellents with DEET are most effective against ticks and mosquitoes, which can transmit Lyme disease (ticks) and West Nile Virus (mosquitoes). The American Academy of Pediatrics recommends using repellents with 10% – 30% DEET on children over 2 months of age; DEET should not be used on children under 2 months. Note: Avoid using combination sunscreen/insect repellent products as sunscreen needs to be reapplied every two hours; insect repellent should not be reapplied. Apply sunscreen before repellent to ensure effectiveness of both products. Avoid areas where insects nest or congregate, such as pools of stagnant water, flower gardens, wooded areas, and uncovered food. 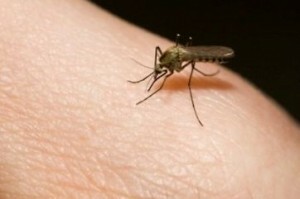 Mosquitoes are prevalent from dusk to dawn, so try to stay indoors during these times if you can. Also keep away from bee hives and wasp nests and do not try to knock them down as this will agitate the insects and prompt them to attack. At the end of the day, check your body and your children for ticks. Pay close attention to the back of the neck and ears, the groin, the scalp, and the armpits. If you find a tick, follow these instructions for tick removal from the Centers for Disease Control and Prevention. Bright colors and floral patterns will attract bugs. Wearing light colors also makes it easier to spot ticks. Be sure to wear long sleeves and pants when going on hikes or in wooded areas. Tuck shirts into pants and pant legs into socks or boots for extra protection. Dogs are very susceptible to tick bites and can transfer ticks into your home. Talk to your veterinarian about flea and tick control programs for your pets.